Managing the spooky horse takes more than just de-sensitizing. We all have a spooky horse story. Not all of them involve high winds and horse antics. In fact, one of our most memorable trail rides was on a beautiful sunny day in August. The day was calm without so much as a gentle breeze to stir a fallen leaf, let alone bring trees down. Yet, that’s exactly what happened. A large tree limb crashed down just in front of my husband’s very green trail horse and well…you can imagine that things didn’t go well. Some rides you’re just happy to have survived. That was one of them. Yet, there is something about this time of year, October and November, when even the calmest of horses can show a little spook, most often when you least expect it. I don’t know if it’s the gusty winds, the chilly temperatures, or all those hobgoblins and ghosts, but I my horse is spookier in the fall. De-sensitizing to all those spook-worthy objects is the first tool in our arsenal and it’s the one we think of first, but there are other things that can be making your horse jumpy. For this, I turn to the most “bomb-proof” horses in the nation, the New York City Mounted Police horses. The New York City Mounted Police horses remain calm even in chaotic environments like those found in the Bronx and Coney Island. The mounted police force takes a somewhat holistic approach to getting this accomplished. They give the horses a full round of exposure to things they might encounter, including fog machines, honking horns, bags of noisy tin cans, firearms, and getting bumped and jostled from all directions. 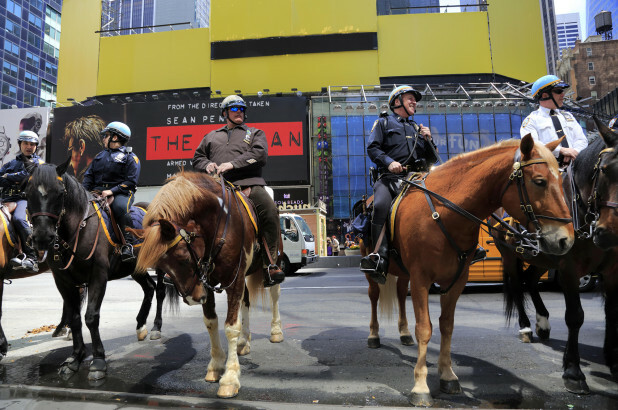 The horse is only half of the equation according to the New York City mounted police. Riders work hard at staying fit and balanced in the saddle so that no matter what their horse might do, they can ride the spook. 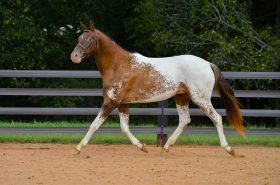 Riders are also taught how to read their horse’s body language as well as how to monitor and notice changes in his well-being. They ride a wide variety of horses before they’re given their own special mount which goes a long way to improving balance and skill. Cut yourself (and your horse!) some slack. Keep in mind that all horses spook at one time or another. If you’re embarrassed because you’re riding the most fractious horse on the trail ride, cut yourself (and your horse) a little slack. Chances are the other riders have dealt with spooky horses in their riding history. There really is no such thing as a ‘bombproof horse’. Feeling embarrassed while you’re trying to manage your horse will only make you more tense. If you’re riding with a good group, trust me…they’re rooting for you. Body position is critical in calming a spooky horse. If you’re riding with tension in your hands, wrists, shoulders or back, chances are your horse will think something terrible is about to happen. Practice relaxation techniques like centered breathing off your horse as you go about your day. Take this skill to your next riding session. Check your horse’s body position. I once rode out with a woman who felt her horse needed a running martingale. Her horse had a naturally high head position and every time he ran into that martingale it seemed to startle him. I asked her to try riding him without the martingale. On the very next ride her horse rode out with his head at wither level and was much, much calmer. 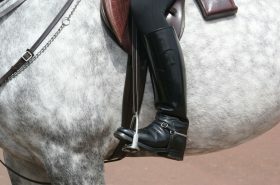 You can put this to work for you by simply teaching your horse to lower his head whenever you pick up a single rein. Lowering the head to wither height or below helps to calm your horse and can avoid a spook altogether. If your horse is spooking and wants to bolt, do your best (using one rein and leg) to keep him facing the spooky object. This can be challenging but is the best way to manage a spook. Your horse’s first instinct is to get as far away from the spooky object as he can. As soon as he has his bum turned towards it, he may bolt. Prevent this by doing whatever you can to keep him facing his challenge. If your horse is spookier than most or just more spooky lately, take a close look at his diet, especially if you feed grain. Keep in mind that what goes in must come out—and we’re not talking about manure, instead, we’re talking about energy. To many horses, grain is like caffeine. If you have more than your fair share of caffeine you’re likely to be a little jumpy, too. 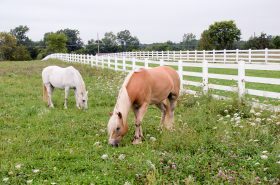 Consider switching your horse to a low sugar grain or eliminating it altogether. Vision problems, ear troubles, or pain anywhere in the body can be a reason for the sudden onset of spooky behavior. 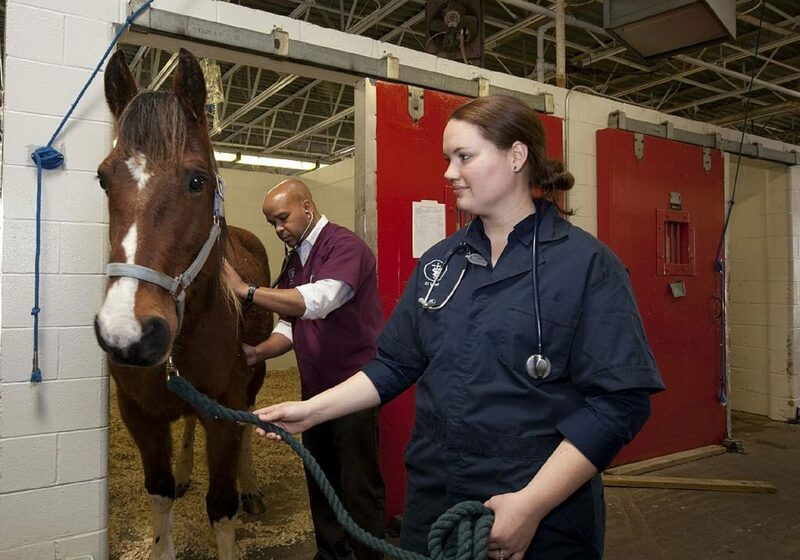 Most horses are stoic, so if you suspect a health problem consult your veterinarian to rule out a problem. Sleep deprivation is one of the primary reasons for spookiness in horses. Horses that do not feel comfortable lying down in their stalls or are low man in the herd may simply be suffering from sleep deprivation. Your horse should have a comfortable place to spend time in a recumbent position. He needs that for mental and physical restoration. Just as in humans, a good night’s sleep is imperative. Consider mats or a stall mattress for comfort. It’s so tempting. Your horse did so well on the trail ride with another calm and experienced horse so this week, you’re going to ride him cross-country in that busy hunter pace. Probably not a good idea. Think little steps that build his confidence. It is always a good idea to get professional help if you feel you need it. Sometimes just a few lessons or training sessions can set you back on the path to happy and calm rides. What spooky antics is your horse up to this season? Do you have any tips or stories to share?